Caring for African Dwarf Frogs is very easy; they’re the best aquatic frogs for beginners. The most important aspect, aside from daily feeding, is the size of their tank, water temperature, and water quality. Since these species spend all their time in the water, you must pay careful attention to the quality of water. As with all amphibians, tap-water with chlorine is harmful. Other water sources can be harmful as well, but don’t let this keep you from getting one. I’ve listed some safe-water sources in the sections before. They became popular in the 1970’s due to their hardy nature and low maintenance. Interestingly enough, these frogs are strikingly similar to the African Clawed Frog. They’re so similar, in fact, that they’re often labeled and sold under the wrong name. Here is how to tell the difference between a dwarf frog and clawed frog: ADFs have all webbed feet, eyes on the side of their head, and have a curved snout. ACFs only have webbed back feet; their front feet are independent digits. Also, their eyes are on top of their head and they have pointed snouts. African Dwarf Frogs, as their name suggests, are from Africa. They’re mostly found in the Congo river but they can be found in Gabon, the regions in between the two and even as far north as parts of Cameroon. They spend their time in creeks, ponds, and other shallow bodies of water. Some species have a gray and black coloration while others are greener. Hymenochirus feae can be darker in color, looking almost completely black. Because of their colors, they blend in with mud, twigs, and leaves resting at the bottom of streams and ponds. 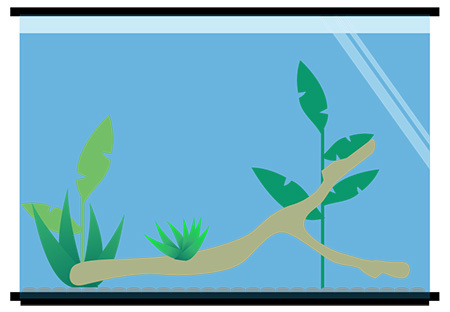 To set up a tank for an African Dwarf Frog, you’ll need to start by finding the proper-sized aquarium. The aquarium can be as long as you want, but the height should be 12 inches. Lucky for us, most tanks have a height of 12 inches. The size of the tank should be adjusted depending on the number of frogs. A great start is 5 gallons per frog or larger. As far the decorations go, anything will work as long as you create multiple hiding spots for your frogs. Any type of aquarium safe decoration, branches, logs, real or fake plants, and so on. I’ve even seen people use clay pots to create a hiding place and they worked great. Here are a few items you’ll need. One of the most important parts of the entire cage is the screen lid. African Dwarf Frogs, while aquatic, are still able to escape out the top of the aquarium. Due to this, you need to fit the top with a screen lid to prevent them from escaping! These frogs don’t require UVB lighting like other species do. They need a regular day and night cycle though. If their enclosure is placed near a window or in a room with plenty of natural sunlight, then it will probably be fine. Should their tank be placed in a dark room with little or no natural light, it’s a good idea to purchase a basic aquarium light; an LED light hood or something similar will suffice. Another aspect to consider is live plants. This all depends on your setup, of course. If you’re using live plants, they will need some form of growing light. 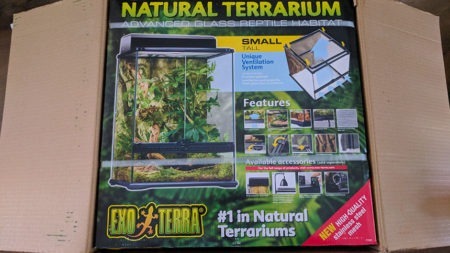 Again, this is only for the health of the plants and not the frog. 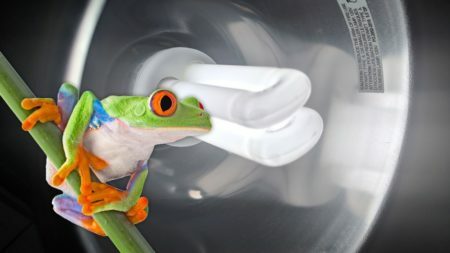 A low-powered, LED grow light won’t harm your frog. 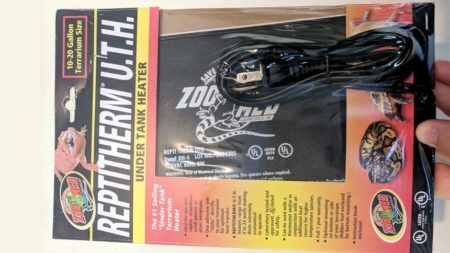 The suggested temperature range for these aquatic frogs is between 72 – 82 degrees Fahrenheit; Not quite what I would call “room temperature”. Perhaps on the lower end of the suggested range, but temperatures at or below 72 for a sustained period of time are not recommended. To fix this, I suggest using a cheap aquarium heater. Keeping the water temperature right around 78 degrees Fahrenheit is ideal. A substrate is recommended to cover the bottom of the tank. This part is entirely up to you; aquarium gravel comes in all sizes and colors. The one thing I would be mindful of is the size. 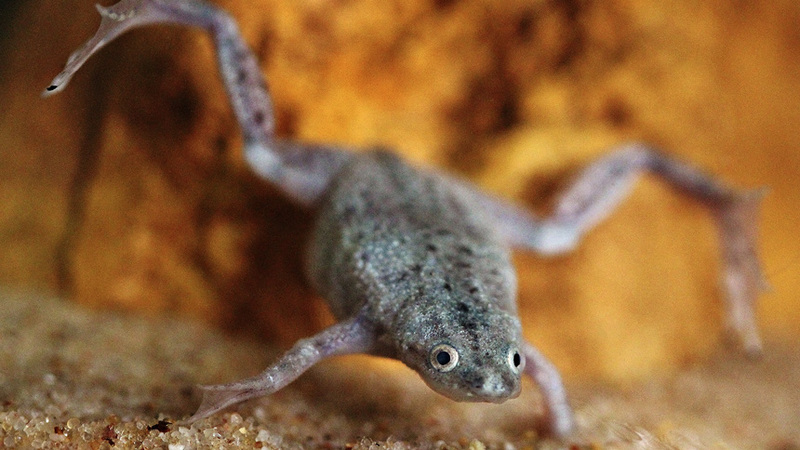 Tiny gravel runs the risk of being consumed, by accident, by your African Dwarf Frog. This is known as impaction. Impaction occurs when non-digestible substrates are accidentally consumed by your pet. It most often happens during feeding time, when your frog is rushing to eat its fill of food for the day. Upon eating its food, it may eat some tiny gravel as well. The food is digested but the gravel is not. Over time, the gravel builds up and becomes harmful, often resulting in death. With that in mind, I suggest using a medium-sized aquarium gravel for the substrate. Something too big to be consumed by your frog. Also, gravel too large can pose a threat as well. Juvenile ADFs have been known to get wedges in-between large pieces of gravel. Should you decide to use live plants in your tank, you’ll need a substrate designed for growing live plants; something like Flourite. I encourage you to seek out another source for this type of information, as I’m not qualified to suggest products for live plants in an aquarium. High water quality is important for all amphibians, especially aquatic frogs like the African Dwarf Frog. The reason it’s so important is that amphibians have semi-permeable skin. Anything that comes into contact with their skin can be absorbed. Take water, for example; oxygen in the water is absorbed through their skin. This allows the frog to stay underwater for long periods of time. As you can imagine, toxins within the water will be absorbed as well. For this reason, it’s important to use dechlorinated, toxin-free water. As an added benefit, amphibians enjoy water that has natural minerals and a neutral pH level. Tap-water often contains chemicals like chlorine, fluoride, and chloramine. 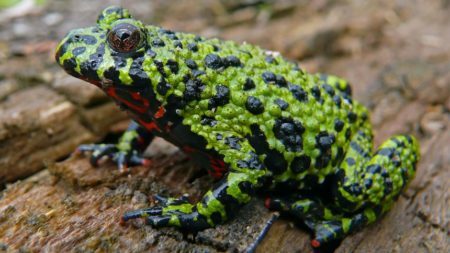 They’re used to clean and treat the water for human consumption, but they’re harmful to amphibians. I recommend using a water conditioner like ReptiSafe to remove the unwanted toxins from the water. Alternatively, many people use bottled water or filtered water. To learn more about the ups-and-downs of each type of water, see our safe water guide for amphibians. As for filtering the water, many people utilize external canister filters for ADFs. They help to filter the water to provide a better environment for your pet. But there seems to be some controversy on this topic. The controversy is whether or not the constant noise output created by the water filter is harmful or, at a minimum, extremely annoying for the frog. I won’t try and persuade you either way. Instead, I’ll offer two solutions for you. If you want a water filter; use one. If not, you’ll need to clean the water more often. Either way, you need to perform partial water changes as needed. As always, ensure the water is clean and at the proper temperature before using it! This species is known to eat just about anything you put in front of it. Among the most popular foods are brine shrimp, bloodworms, fish food pellets, worms, and the specialized aquatic frog and tadpole food. Zoo Med makes a pellet style food called “Aquatic Frog & Tadpole Food” that is filled with vitamins and minerals. I recommend using this in addition to some live foods. A diet consisting of a variety of quality sources is the best way to keep your pet frog happy and healthy. More often than not, ADFs will breed on their own, without manipulating their captive environment. In rare cases, however, ‘cycling’ might be required to get your frogs to breed. Should this be the case, I wrote a small guide for doing this, in the breeding section below. The first step in breeding African Dwarf Frogs is ensuring you have both male and female. To do this, examine your frogs for the following characteristics. Male ADFs are smaller than females, in length and bulk. Also, they have a white or pinkish gland just behind their armpits. Last but not least, males call-out to attract the females. Females, on the other hand, are slightly larger in length and overall size. They’re often described as “chubby” in comparison to the more slender males. 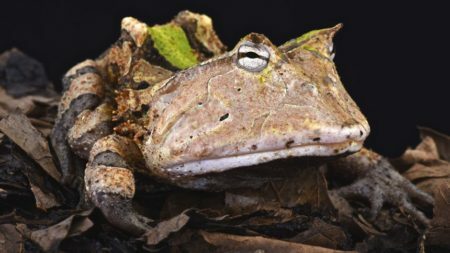 For some keepers, their aquatic frogs breed with little or no help from them. Its common to walk into the room only to find a bunch of eggs in the aquarium. For others, it’s not so simple. A sure-fire way to get your ADFs to breed is by ‘cycling’. Cycling refers to manually adjusting the water levels and temperatures to mimic the changing of seasons. This species mates during the springtime, when warm air and rainfall increase the water level and temperature. This is how to adjust the water to get your African Dwarf Frogs to breed. Decrease the water level in the aquarium by 2 – 3 inches and allow the temperature to decrease to 65 – 68 degrees Fahrenheit. If possible, decrease the day-time hours to 10 hours of light each day. Hold these conditions for 30 – 45 days. After that period of time, raise the water levels back to normal and increase the temperature to 78 degrees. Increase their day-time hours to 12 – 14 hours of light each day. In most cases, the increase in water level and temperature will provoke your frogs to breed that night or the next day. 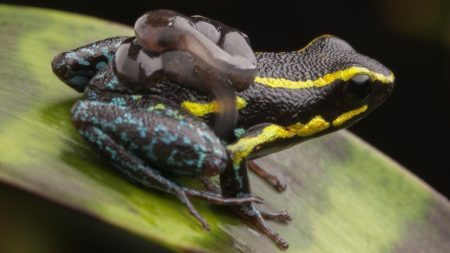 Should you have any luck, you will find your dwarf frogs in the amplexus position; where the male grasps the female around the back as eggs pass through her cloaca; the eggs are fertilized, by the male, outside the body. Your frogs will remain in this position for 2 to 48 hours. Once the eggs are laid, I recommend removing them from their parent’s tank. Place the eggs in a separate container with clean, dechlorinated water with a temperature around 78 – 80 degrees Fahrenheit. The eggs should hatch in 48 – 96 hours. After hatching, they might remain motionless for a day or two. At this point, you should begin feeding them. Many keepers have found success in using liquifry, which is meant for small egg laying fish. At around 7 days, they will begin eating tiny, newly hatched brine shrimp. Continue feeding the tadpoles and performing partial water changes, being mindful not to spike the pH levels too drastically. It will take around 60 days for the tadpoles to metamorphose into little froglets and then juvenile, fully formed frogs. It probably goes without saying but you should avoid handling your ADF at all costs. Don’t be discouraged, though. Many keepers have been able to train their frogs to eat food from their hands. This, of course, requires you to stick your hand in the water which means you should definitely clean your hands before and after. But it’s still an option! The ultimate goal in this is to have small interactions between you and the frog while doing your best to keep chemicals out of their water. If you have soap residue on your hands, it will certainly come off in the water and might pose a problem for your pet(s).